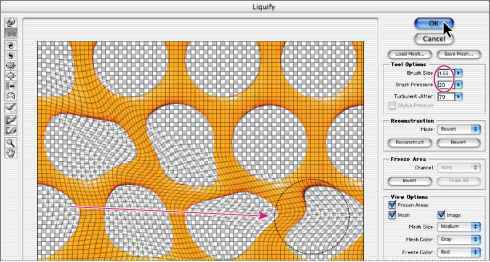 Now you'll warp the layer with the Liquify command and warp tool. 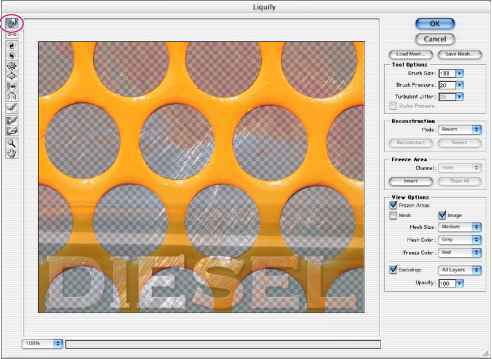 The Liquify filter works by applying a mesh warping. This distorts the image by dragging handles at the intersection of a hidden grid or mesh. 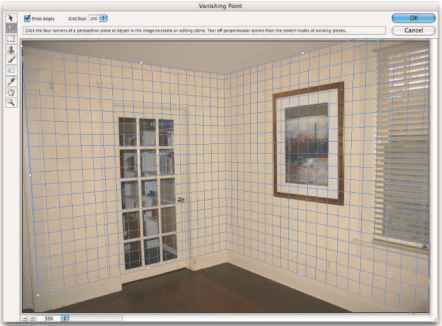 Turning on the mesh visibility can help you understand more clearly how you're manipulating this grid and the different effects created by the various liquify tools. 1 With the Metal Grille layer selected in the Layers palette, chose Filter > Liquify. • In the upper left corner of the dialog box, make sure that the warp tool (vO is selected. • On the upper right side of the dialog box under Tool Options, select a brush size that's the same size as the holes in the grille (we used 133). Then for Brush Pressure, select a moderate value (we used 20). • (Optional) Under View Options on the lower right side of the dialog box, select the Backdrop check box, make sure that All Layers is selected on the Backdrop pop-up menu, and then drag the Opacity slider or type 100%. These view options make the layers under the Metal Grille layer visible. This can be visually confusing until you get used to it, especially because as you work you'll continue to see both the original metal grille and the liquified metal grille ghosted over it. To return to your original view, just deselect the Backdrop check box. 3 Still in the Liquify dialog box, drag the brush across and down the image once to start applying the Liquify filtering effect. 4 Under View Options in the Liquify dialog box, select the Mesh check box, and deselect the Backdrop check box, if necessary. Notice how the mesh has been distorted by the warp tool. 5 On the left side of the dialog box, select the turbulence tool ('^0, and drag the brush across another area of the metal grille image. Notice the differences between the results created with the warp tool and the results created by the turbulence brush: The warp tool simply pulled the mesh and image in one direction. The turbulence tool creates an additional random distortion. Note: If you make mistakes or don't like one of the brush strokes you apply, press Ctrl+Z (Windows) or Command+Z (Mac OS) to undo that step. If you want to undo more than one step, click Cancel to close the Liquify dialog box, and then start the process again. 6 Continue to apply different effects to the metal grille. When you are satisfied with the results, click OK to close the Liquify dialog box.